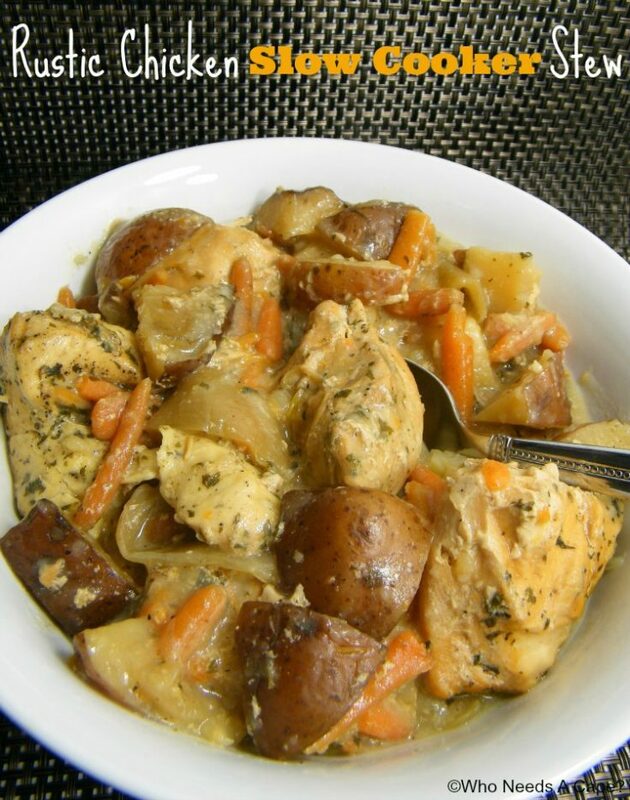 Rustic Chicken Slow Cooker Stew - Who Needs A Cape? 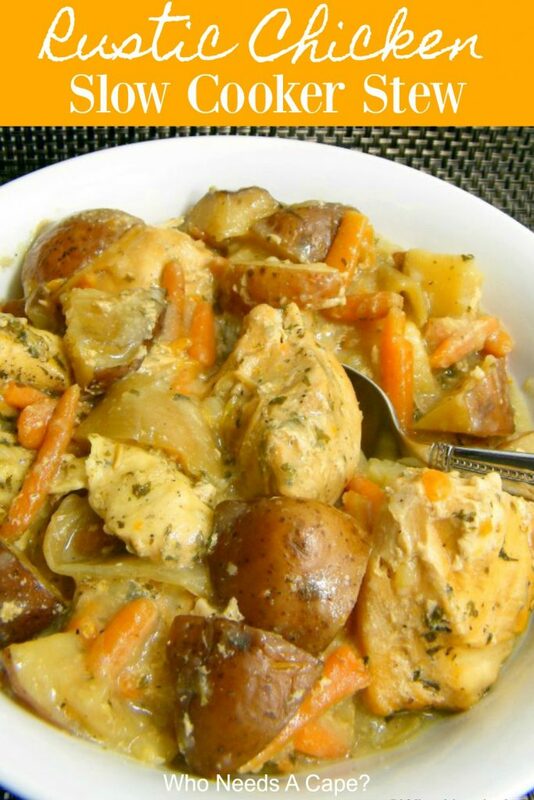 Rustic Chicken Slow Cooker Stew, a hearty dish that the whole family will enjoy. Tender chicken, carrots, potatoes in a thick sauce, the perfect combination. It’s been a harsh winter here in Michigan, every year I think I say this but truly this one has been bad. A lot more snow & cold than we are accustomed to in these parts. 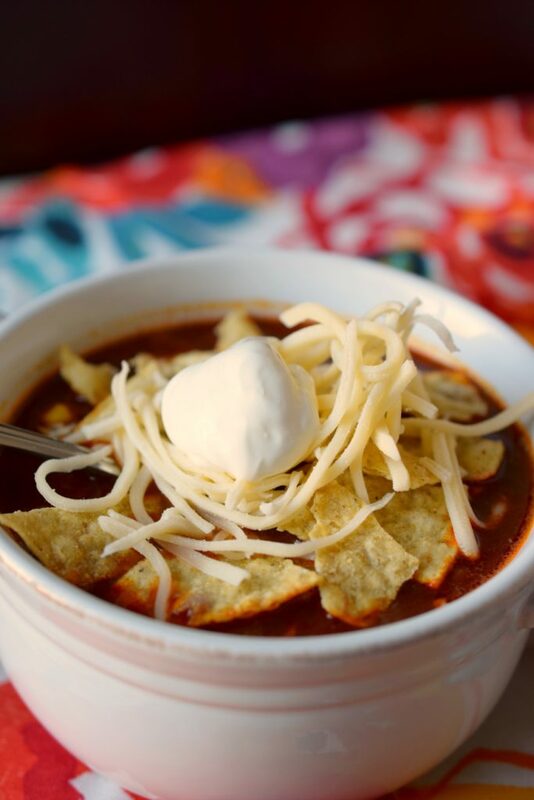 To combat the extra cold temps, comfort foods have taken a footing in our household. Take this Rustic Chicken Slow Cooker Stew for example; hearty, satisfying and easy-peasy thanks to your good old slow cooker! If you need a comforting dish that sticks to your ribs and leaves you satisfied, give Rustic Chicken Slow Cooker Stew a try. I’ve included freezer instructions along with the recipe below. With carrots, potatoes, and onions, this is a flavorful dish that also reheats well for leftovers. So get your crockpot out and give the family a new meal to love. 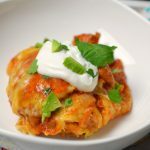 This was one of my personal favorite dishes from my “7 Meals in 1 Hour” slow cooker/freezer meals post, click HERE to check out all of the recipes! This isn’t a very saucy dish, there’s just enough sauce that it coats the chicken and veggies nicely. If you’d like a saucier dish, add more liquids at the end. Pair alongside a glass of white wine, some fluffy biscuits and try to forget the freezing temps and piles of snow (at least for dinner time)! Please note: If you are prepping this dish for a freezer meal, I chose not to freeze the potatoes. This is just my personal preference. 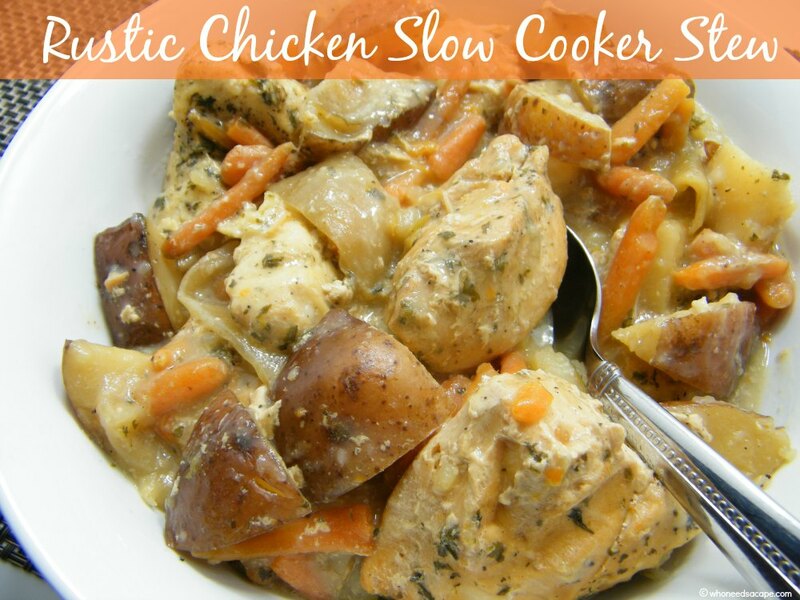 Place chicken, seasonings & all vegetables into slow cooker. 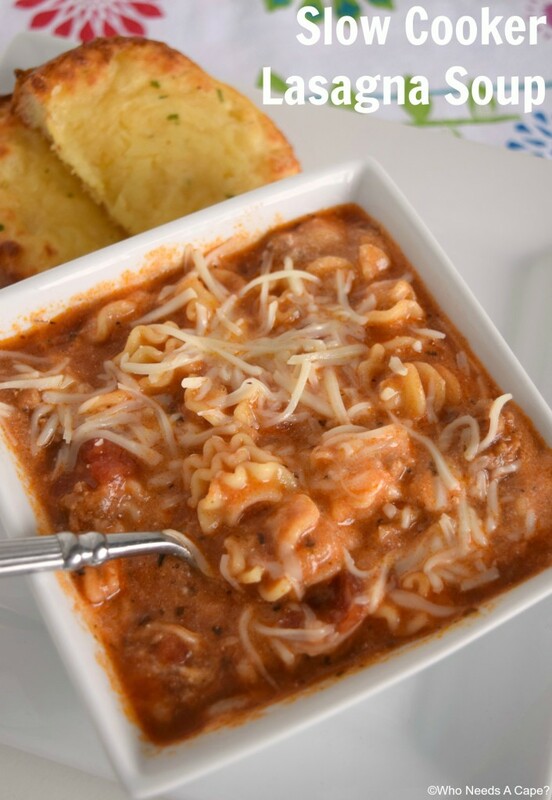 Whisk cornstarch into milk, stir into slow cooker and cook 15 additional minutes on high. This looks amazing! 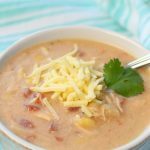 Thanks for linking this up at The Magical Slow Cooker’s Sunday Dinner Link Party! Had this after freezing tonight. Very tasty but I will add more carrots and a bag of frozen green beans next time. Just like more veg. 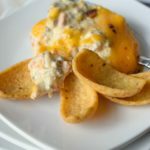 I am making this right now, I sampled a couple of bites, it is really good. I will be making it again,next time with dumplings.Thank you for making this site it is great. Does anyone add more liquid to this? I worry that using just a half cup water for the only liquid not being enough. Anyone feel up to calming down? That much liquid is fine for this dish, at the end you are adding an additional 1/2 cup of milk. Hope you enjoy. I made this last week, it was a big hit for all four of us adults. I am loving the freezer cooking, Tomorrow the Mexican shredded beef. I love this dish! It’s the last one of our “7 Meal” challenge and my absolute favorite! I’ve got this in the crockpot now. I used an entire small bag of baby carrots and few more red potatoes. I added a few extra spices to it. It smells great. I was hesitant about the ½ cup liquid but it seems to be doing fine. I can’t wait to eat it with dinner. I may actually add a side of roasted asparagus. I made this tonight and it was delicious! The only slight problem was the potatoes and carrots were kind of hard still (after 6.5 hours). Any ideas for making them softer? Do you have to cook beef or chicken prior to freezing or can you just put it all in the freezer bag while raw & then cook it up after thawing? Hi Abbey, Everything goes in raw for this recipe. It all gets slow cooked together. Hope you enjoy! Hello! Do you have to freeze everything or can you get them fresh then cook? Hi Chelsea, Yes you can definitely cook without freezing. Hope you enjoy! Personally I have not, my kids wouldn’t eat it if I did LOL. My suggestion would be to add them closer to the end of cook time, that way they don’t become mush. Let us know how it turns out! Actually sweet potatoes take longer cooking in the crock pot then red…. How long can I have this refregirated for if I wanted to separate in 5 tuppawares for lunch? Also, and I apologize because I am new to slow cooking, but do you, or can you, freeze it after you cook and just heat it up that day in a microwave? Could you do this with bone-in chicken, like legs or thighs? I just came across this on Pinterest and it looks delicious! Unfortunately the only ingredient I don’t have is milk. It seems like it’s pretty important to the recipe, or do you have any suggestions for a substitute? Thank you! Can you use white potatoes instead of red potatoes. How many potatoes wether red or white how many many make 1 1/2 pounds? Lisa, you certainly can use white potatoes. Size will vary on the potatoes, hard to say how many would equal 1.5 lbs, I eye-balled from a 5 lb bag. Enjoy! This particular recipe serves 4-5 people. Hope you enjoy! Do I need to cut up the chicken? Hi Jenny, I cut the chicken breasts in 2 to 3 pieces so they were a smaller size. You could certainly cut them into smaller chunks if you prefer. Hope you enjoy! why don’t you freeze the potatoes? It is a personal preference. I’ve heard they can turn brown, didn’t think that would be very appealing. 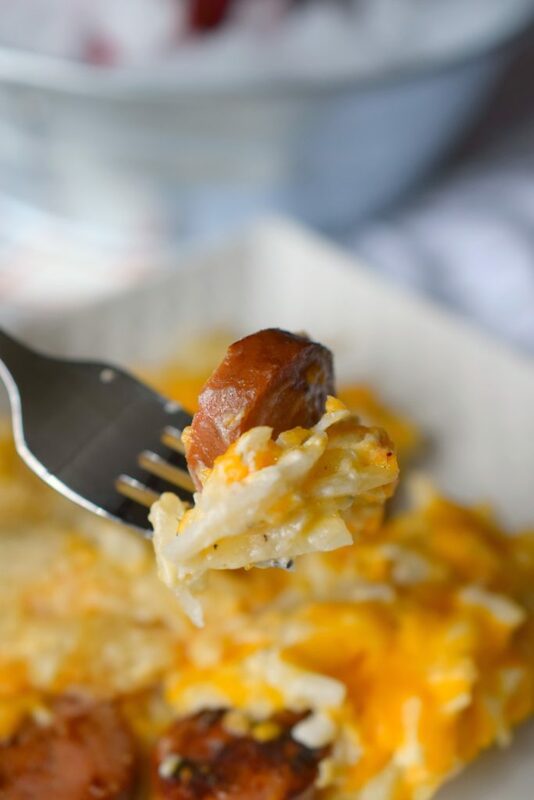 made this for dinner tonight & is it going to become 1 of my favorite comfort foods for this fall/winter! I used bone-in chicken thighs instead of breasts & also added celery ( cooked on high the whole time). The meat literally fell off the bone & became more like shredded chicken…. SO GOOD!!! So glad you enjoyed Julia, it is definitely a favorite with my family! If I wanted to add dumplings would I just add them in at the beginning too? Anything else I should do if I decide to add them? Thanks! Sarah, The only experience I have with dumplings and a slow cooker recipe has me adding them approximately an hour prior to the end of cooking time. They might absorb quite a bit of the liquid, so you may want to add a touch more liquid in the beginning. Let me know how it turns out! We really liked this. As in it will go into our regular rotation. The only thing I needed to change is that I had to add a lot more broth in the end as the cornstarch got the sauce too thick. I should mention that I drained the juices and cooked it on the stove with the added milk and cornstarch since I didn’t have the time when I got home to let the crockpot do it’s magic. So maybe that was the reason. But that just meant more yummy sauce! I also added a little red wine vinegar since it needed a little something and I didn’t want to add salt. Thanks! Can this recipe be cooked on high? And if so, for how long? Hi Tasha, I’ve never prepared this dish on high, but I’m guessing 4 hours might do it. Hope you enjoy! Is everything frozen or thawed when is gets put in the crockpot? I’m not able to freeze anything before hand so I’m wondering if anything changes if the ingredients are not frozen at all. Hi Elisha, You can certainly place all ingredients into the slow cooker unfrozen, nothing changes. Hope you enjoy! Found your recipe on Pinterest! I knew from the pictures I just had to make it.. So, I checked the ingredients… Boneless chicken breasts.nope…baby carrots, nope…red skin potatoes, nope…. So, what did I have.. Chicken thighs on the bone, whole carrots and russet potatoes… I pealed the skin off the thighs….peeled and chopped the carrots into big chunks and peeled and quartered the potatoes. Followed the rest of the recipe and it was delicious! Mine needed a little bit more salt, but it was still awesome! Thanks! made this today as my FIRST ever crock pot experience and it was DELISH! The potatoes were still kind of hard though. i threw them in raw should i have boiled them first ? Glad you liked this dish, it is a favorite at my house. You could parboil the potatoes I suppose or cut into smaller chunks, mine have never been hard so I have not tried either method suggested. This is one of my families favorite freezer meals. It is in my monthly freezer meal rotation and I have shared it with many of my friends. Thanks! Happy to hear you enjoyed, definitely a favorite at my house! I have this in my slow cooker right now and I’m very excited to try it!!!! It sure smells AMAZING!!!!!! I’m always up for another chicken recipe! So, this cooks in just the water base all day, & the milk and cornstarch goes in at the tail end? Yes at the end to thicken the liquid. Enjoy! I made this recipe today and it turned out so well. I will make this again. I saw your recipe and pinned it. I have a question. Are the chicken breasts cut up before you put them in the crockpot? Also, I know that you present this as a freezer meal, will the ingredients be ok if they are not frozen? Hi Valerie, This can absolutely be made without freezing the ingredients. My chicken breasts are cut into large pieces when I prepare. Enjoy! i dont have any cornstarch….and already have it cooking….is there anything else i can use as a sub? I’d think a tiny amount of flour mixed with water would help thicken this up. This is a “keeper” so easy too, so shame on you if you don’t give it a try. So having said that, I did however make just a couple of changes. Used one chicken breast and three boneless skinless chicken thighs cut into chunks. Used 1 lb of large carrots pealed and cut into 1/2″ chunks 4 small russet potatoes cut into chunks as well. Let it go 7 hrs on low. Then added 1/2 a bag of partially thawed peas (15 mins on low). Used 1 cup milk and doubled cornstarch. In hindsight that was too much cornstarch, but alas I diluted it with some white wine and it was absolutely a delightful meal. If you don’t want to use wine, can always use chicken broth or water as others have mentioned. Thanks for such a great recipe! I am trying in the oven now. I’m hoping it comes out ok! I don’t have any cornstarch, is there anything I could substitute, or could I omit that? You could try a little bit of flour. I was just wondering, the 1/2 cup water, do you put that in with the chicken when you cook it for the 6 hours? Or put it in when you put milk mixture in? Just to clarify, does this recipe use one-and-a-half pounds of chicken, or 5 pounds of chicken? (The way my computer is formatting the recipe, I can’t tell if it says 1.5 pounds or one 5-pound package of chicken. Hi Holly, This recipes calls for 1 1/2 or 1.5 lbs of chicken! Hope you enjoy! I want to make this right now! I have frozen chicken, but raw vegetables. Would I still do low heat for 6 hours? Thank you for any help!! Hi Leslie, I’m sure that would work. Hope you enjoy! So far so good! Now I just realized I don’t have cornstarch! Hi, I just found your site on Pinterest. I am trying to budget our meals. We are 3 good eaters, just trying not to spend excessively, lol. Have you figured a budget on this? And if I follow recipes and shopping lists as stated, do you think it saves money? I know it’s already great as a time savor, but I was just curious, as I am new to figuring a budget. 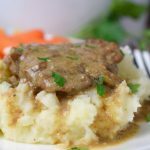 Great site with great recipes. So glad I found it. I look forward to your response! Just made this! Was wondering why it cooked so quickly (done in 4 hours)… I put it on high! Added the milk and cornstarch and it thickened up quickly. I ended up adding another cup of milk and about 3x the seasoning 😂 This would be great with more veggies too. I’m thinking Green beans and celery. Oh, and even on high, liquid wasn’t a problem! The chicken breast juices really did their magic! I am making this right now, about another 3 hours to go. I am going to put in about a cup of frozen peas/sweet corn mix into it at the end when you put in the milk/cornstarch blend. I also put in a couple tablespoons of salted butter and I used some chicken boillion with the water. I also preseasoned the chicken with the lawry’s seasoning salt and put in a few shakes after it was all in there. I also added some minced garlic because I love garlic in everything. But other than that I followed it to A “T”! Oh I also did a shake of Italian seasoning as well. I am sure it will be a hit! 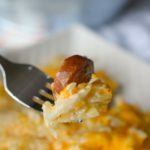 I just found this recipe, so I’m very late to the game, but wanted to address the hard potato issue. I have no idea why but years of experience have taught me that if you use russet potatoes, they have to be peeled or they will stay hard as rocks. Doesn’t matter how small you cut them, peels = rock hard 😕 frustrating as it takes more time to get everything ready. Anyway, got my stew going and excited to try it tonight! Any tips on trying it in the instant pot? 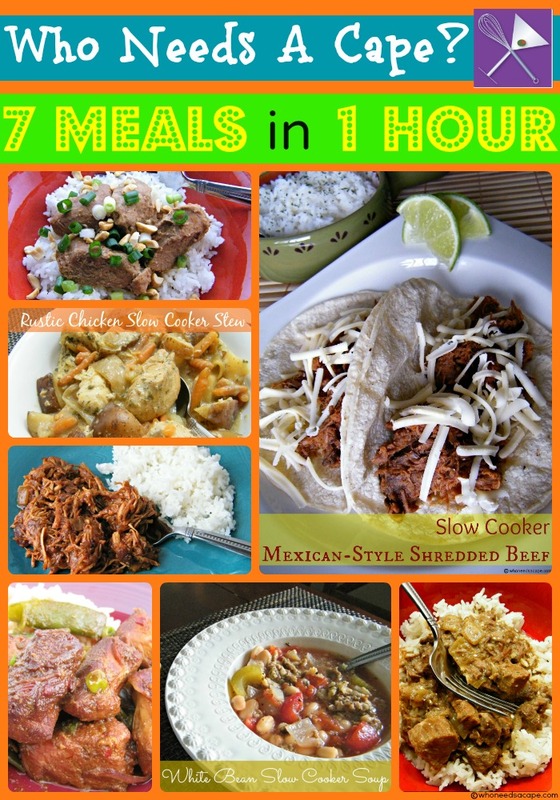 I don’t have enough time in the morning to dump a freezer meal in the crock pot but get off at 2pm. So enough time to prep a meal for the instant pot. Just curious to know what cook time conversion would be. Thank you! I’m sure you can, hope you enjoy! I do not have any cornstarch any thing else work? Hi Amber, You can mix a bit of flour and water together then add in. It will help thicken also. No complaints! By anyone! Delicious. I eye-balled the spice and probably put in a little more than called for. I also added 2 bay leaves. Other than that, SO easy. Thank you! 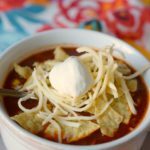 I know this is a long shot but does anyone have a instant pot conversion for this recipe? The rustic chicken. …when do I add the water? …. Loved this. I double the chicken and onion and added bacon. I didn’t get my sauce to thicken up as much as I should have, but I’ll get that part right next time. Your rustic chicken stew was fantastic! It’s now on my list of favorites. I do have a question. If I wanted a bit more gravy, would I just add a bit more milk with the same amount of cornstarch, or would I increase the cornstarch too? Thanks! Hi Linda, Glad you enjoyed! I would probably increase both the milk and cornstarch unless you wanted a thinner “sauce”. Thank you for stopping by.